What is social media exchange? Social media gains main role in internet marketing, particularly in branding a company or website. Now a days Buying Facebook likes, Facebook reach, Facebook shares, are much costlier because of its popularity, similarly twitter followers, tweets, Pinterest followers, Instagram followers, and similar Social media sites functions also. 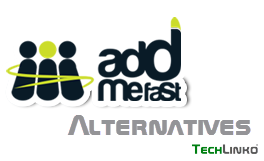 That’s why the third party sites like addmefast and its alternatives will help internet marketers to get social media attention. Social media Exchange sites list 2014 this list is based on the reference of Global Alexa ranking. This exchange system allows you to pick and choose who you want to follow, like, view and skip those who you are not interested in. The exchange system is very simple. Every time you like, follow, or view another members social media pages you will receive coins which then you can use to get more followers, likes, views or visitors to your website or social media pages. You can increase Your Social Presence and Social Branding! Over 190,000 Members and more!!! Shareyt is a crowd-sourcing platform to help you improve social media presence, get more exposure and boost search engine ranking Free. Followlike is more than a Social Exchange. You can improve your SEO, Backlinks, Traffic and Social Marketing. And it's a showcase for your Social Media and our members will like your content if they find it interesting. In this exchanging network where people share Facebook Likes, View YouTube videos, provide Google-Plus or Visit Websites. In return they get points. These points can be used to get additional fans or convert points to money for cash out. LikesPlanet is your way to advertise your social pages or earn money by doing this. YouLikeHits is a promotional tool that will help you grow your Twitter, MySpace, YouTube, Google+, StumbleUpon, Pinterst, SoundCloud and Websites for free. Twiends helps you to grow your audience on Twitter and Instagram. This network will help you to show your presense. I'm using Top Free Likes this is beast website. I get lot of Facebook page likes and after that you can get here twitter, instagram, pinterest, youtube likes and followers. After that you can get soundcloud followers, traffic exchange, and many more. Iḿ using Kingdom Likes a go excelente, test it. Hm, I've tried all this websites, but the best for me is www.likestool.com. First of all LikesTool is cheaper. The second reason is that almost all users of LikesTool are real users, ie I recieve real likes and followers. And the last, it works faster then other websites. Try, you will like it. I think http://socialclickers.com should be there as well. i found some more sites. Get your Website Traffic and boost your Google Rank using our FREE Traffic and Social Media Exchange Services. Bu adresten turbobit premium link generator sitelerini rahatlıkla bulabilir, turbobit'ten sınırsız, hızlı, beklemeden indirme keyfini bedava yaşayabilirsiniz. Get 3,000$ coins for free. I use hitforhit.com you can earn money there too! Want to get unlimited free facebook likes, twitter followers, youtube views, website traffic and many more social pages. Visit the site and get started. Use this coupon to get Free 2000 coins. Coupon = "WELCOME"
Use this coupon to get Free 5 VIP days. Coupon = "5VIPDAYS"
Thanks! Link Collider works for me! Want to get facebook likes, twitter followers, youtube views, website traffic and many more social pages. Visit www.2likes.com and get started. iMacros for AddMeFast, Like4Like, YouLikeHits, Kingdomlikes, Likenation, LikesASAP, LikesPlanet and more! Shareyt still best for facebook likes and earning money doing micro jobs. Pretty good list you have here. Thanks for sharing. check out http://www.fangrow.net and get 200 coins for signup. As mentioned before, Linksys business enterprise released this particular IP address as default gateway to the wireless router management page and then taken by a few other manufacturers. Anyhow some producers have got default IP address aside from this 192.168.l.0. It is very interesting for me to read your articles! But I can see that you have not one very important part of rather good sites - quality web development. I often use this service: http://wezom.com/services/web-development Maybe it will help you to solve the problem, it is only your choise! You Need Social Media Services such as Facebook Likes, Facebook Followers, Facebook Share, Facebook Post Likes, Twitter Followers, Twitter Re-tweets, Twitter Favorite, Instagram Followers, Instagram Photo Likes, YouTube Views, YouTube Subscribers, YouTube Video Likes, Pinterest Followers, Pinterest Likes, Pinterest Re-pins, Google Plus, Website Likes, Website Share, Website Tweets? Feel free to leave us a comment. Click our Social Media Services Website.